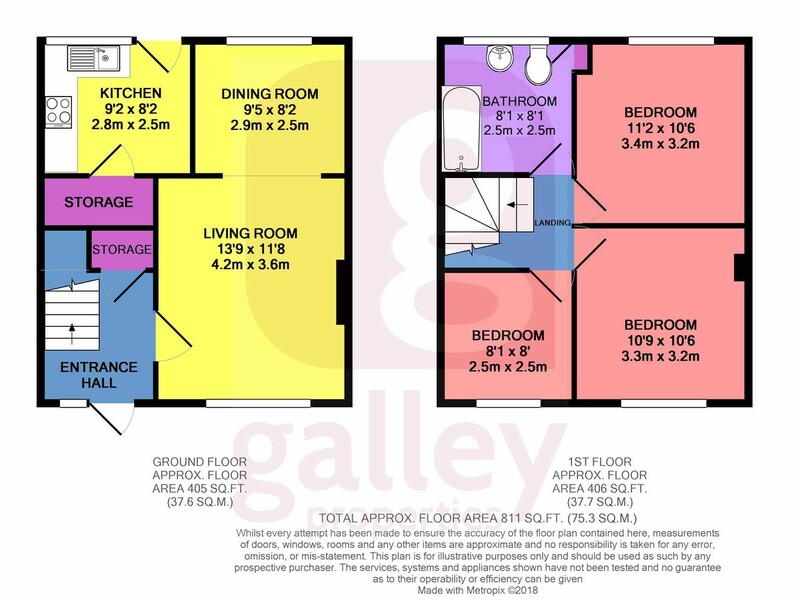 MAIN DESCRIPTION Galley Properties are pleased to offer this well presented 3 Bedroom Mid Terrace Property which is sure to appeal to a First Time Buyer or Investor, (lastly generating a rental income of £5,160pa). Just a short distance from the motorway and train station and close to several schools and amenities which makes it ideally placed for families with children or commuters. The property is double glazed throughout with gas central heating and benefits include a garage. Finished to a high standard with modern fixtures and fittings throughout, viewing is highly recommended. LIVING ROOM 13′ 9" x 11′ 8" (4.19m x 3.56m) The lounge in this property offers a great family friendly space and the large front facing UPVC window really makes this room feel light and airy, with neutral decor and a contemporary featured wallpaper on the chimney breast providing a focal point. A neutral tone carpet completes the look and leads to the open plan dining room. Power points, coving and radiator . KITCHEN 9′ 2" x 8′ 2" (2.79m x 2.49m) The fully fitted kitchen offers ample work surface with built in oven and hob and extractor hood with a tiled splash back, sink and drainer and laminated flooring, space for a free standing fridge/freezer, rear facing UPVC window and UPVC back door with glazed insert let in plenty of natural light. Door leads to walk-in cupboard for useful extra storage. MASTER BEDROOM 11′ 2" x 10′ 6" (3.4m x 3.2m) A spacious, light and airy double bedroom with natural light provided by front facing UPVc windows. Neutral décor with provides a tranquil feel. Original coving, radiator and numerous power points. BEDROOM 3 8′ 1" x 8′ 0" (2.46m x 2.44m) This bright clean room can be used as an office or great third bedroom, UPVC window overlooking the front garden. Radiator and power points.